Have to say by the way, fair play to the ref who tried his best with us to see the park playable. Sensible decision reached, however unfortunate! Glad to hear it, Ally is a cracking keeper & a top lad. He was between the sticks for us last season when we won at yours & he was excellent that day too. Thought Clydebank were excellent yesterday, they were right on it from kick-off & did everything with pace & intensity and were a class above us I’m afraid. Sometimes you get frustrated at your own teams’ shortcomings, but on occasions like yesterday you just have to hold your hands up & say the opposition were better. Good luck to you all for the rest of the season, I fully expect to see you lifting some silverware at the season’s end. 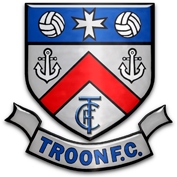 Troon v Medda is ON! Portland Park is looking great despite the rain. Any neutrals are welcome down by the Seaside, 2pm kick-off. Mark Shanks was the Manager when we won the West. Former Ayr United & Girvan player Steven McCreadie has been made available for transfer at his own request. Any interested parties, please contact me directly or by DM. Further details on our website. All credit to Kilwinning for that one to be honest, in the last few games midfield runners have been everywhere but we just couldn’t get out yesterday because your midfield were popping it around so well. I agree with Deano, one of the best teams I’ve seen in a few years based on yesterday’s performance. Well done to Chris & also well done to Colin (KR Chairman) for yesterday, good luck for the season. This season was always going to be a learning curve for everybody with a new league structure, more league games, different sectional set-up and new fixtures Secretary. It was never going to be perfect straight away. I reckon fair play to Kennie for listening to club’s concerns and acting upon them. Folk say this sort of thing, but the Pollok fans, management, players & Committee were a credit to their club yesterday. Great from start to finish & a pleasure to have at our ground. Good luck to them for the rest of the season & I look forward to the return leg later in the year. Talbot 1-1 Troon FT Boys were fantastic tonight, with a good few missing, and gutted to concede after going down to 10 men. We had already arranged a game for today against Gartcairn before Kilwinning contacted us unfortunately. We are now playing Gartcairn at the showpark in Kilwinning at 2pm on Saturday. As per the constitution changes last summer, the fixtures for the first half of the season are to be issued at tomorrow’s AGM. Therefore, I’d be expecting any potential Secretary candidates to be coming to the meeting armed with a set of fixtures.